The Faux Reform Crowd are hilariously heavy-handed. May it ever be so. LOL! Well THAT didn't take long. A clerical error, in only one of many documents, on a number everyone knew beforehand, and was corrected as soon as it was noticed, after being so out of place it was noticed quickly is a 'warning sign'? I got Jackie's warning sign for her right here: It's called the revolving door between faux military reform operations and Prog legislators teamed in a pernicious self-licking ice cream cone with Punk Journalists . 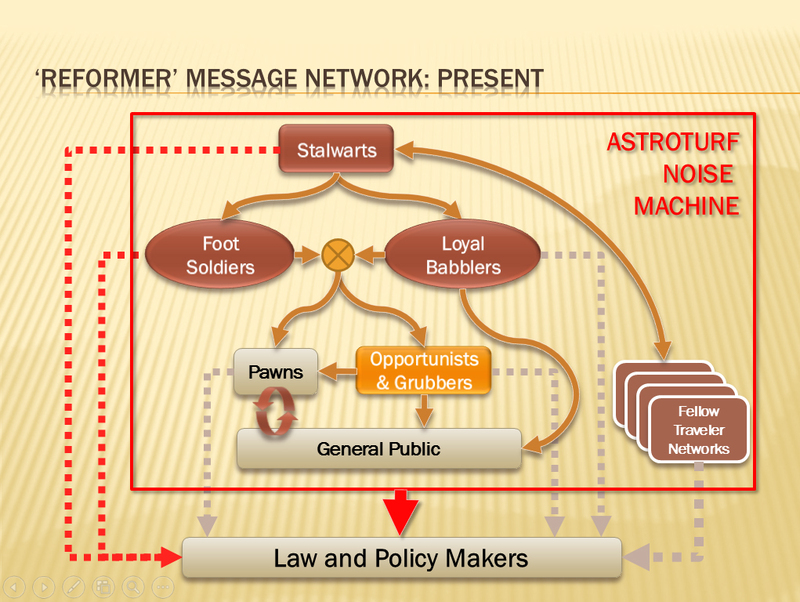 That IS the "Faux Reform Message Machine". I could take these people if they were honest with their arguments, but if they were honest with their arguments they couldn't stand the laughing. Back on the 15th, the faux military ‘reform’ F-35 Ejection Seat narrative got a boost in circulation when it hit the Political website ‘Roll Call’. The author clearly didn’t understand what was or was not important on the subject of ejection seats, and quite frankly, the story RC was pedaling wouldn’t hold up to even the most casual review by anyone who has ever been AIS (A**-in-Seat) in one while “slipping the surly bonds”… or worked on or around them while on the ground…or worked/trained in aircraft safety or reliability. When the meme first emerged in a DefenseNews story on October 1, I thought at the time that the story’s timing and meme might be a POGO aka ‘Straus Military Reform’ disinformation piece. Given the machinations to keep the ‘story’ going in spite of its idiocy being proffered, I am now even more convinced of same. This post WAS going to be a straightforward point-by-point ‘fisking’ of the faux F-35 seat story as breathlessly reported at Roll Call, but the story became so bizarre in the spreading of it—and the speed of it--that the story had pretty much fisked itself before I could take the time to do it for you. Does Ignorance or Ideology Inhibit Defense Reporting? I didn’t (still don’t) have time to completely disabuse all of the people who reported all of this drivel as ‘revelation’. At most it could be called a ‘realization’...that those reporting are ignoramuses when it comes to system and flight safety, fighter aircraft design, risk management, and apparently ‘technology’ in general. The author of the Roll Call piece linked above got the bit in his teeth over the other ‘story’ linked to above that was first written up by an seemingly earnest 'noob' at Defense News named Lara Seligman and a guy named Aaron Mehta. Mehta is someone I’ve had on my ‘faux military reform’ radar for a little while. Mehta’s moved from being someone who produces shaky policy pieces for a so-called ‘good government’ non-profit attempting to influence defense policy to now 'reporting' often on non-profit policy pieces posing as news in defense media. Where's Mehta fit in? Where does Donnelly? We'll have to just keep watching for now. The creative use, abuse, and misinterpretation of what the facts in hand (and those missing) ‘mean’ are what makes the whole F-35 Ejection Seat/Helmet ‘story’ reek of the typical output that comes from the POGO/Straus ‘P.A.C.E.’ generator. While one might get the same writing result that we've seen simply by not knowing WTF one is writing about, one wouldn’t then subsequently double-down on the stupidity when called out on it in the comments. If you count the incremental updates to DefenseNews articles along with the subsequent new stories there and elsewhere, you could make a case for the faux military reform message machine having ‘triple-quadruple-downed’ as the participants have progressively dug their rhetorical heels in on ‘THE STORY!’. “…pilots are rotated backward into a position where they face all but certain death from the rocketing parachute's force snapping their heads…”. 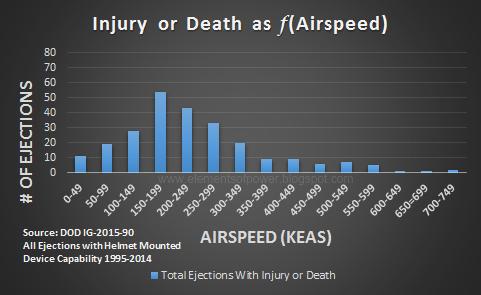 IF you are ejecting, you are already facing “all but certain death”. I may find the time to go into more detail on this someplace else, but there are several notable things about this story, and none of them have to do with what is being said right now. The first thing is that none of the numbers being tossed about indicate what the DIFFERENCE is between legacy (including ACES II) systems and the F-35's MB seat. ALL ejections have serious risks involved which is why they generally only occur when the aircrew determine the risks of staying onboard are greater. 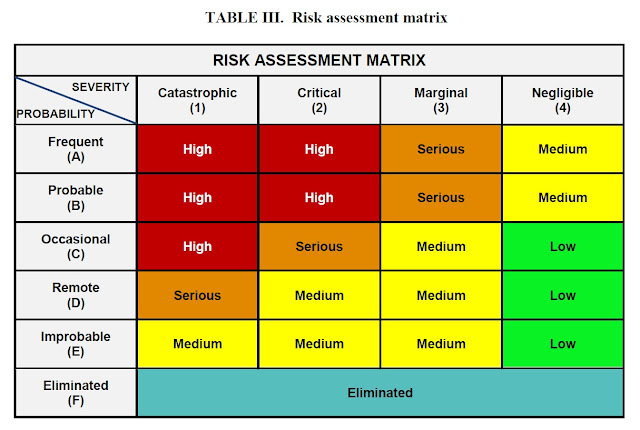 The second thing is that the some of the lower concern weights are outside ANY measured probability of survivability for ANY legacy systems. Those seats were for a much narrower percentage of body shapes and sizes. The third thing is that unlike legacy systems, the F-35 seat is designed for a 'kinder-gentler' ejection to make the seat safer for women of ANY weight at ALL ejection speeds. The greater S-curve of the female spine makes it more prone to 'snapping' with the more violent extraction of older seats. So this also means the average male pilot cannot leave the plane as fast as he used to even if it is more advisable....because EQUALITY! The last thing I have time to talk about here is that this non-story had all the feel of a POGO fueled P.A.C.E. attack. And I suspect it now even more after checking the self-licking ice cream cone at play in Donnelly's Twitter feed. Only thing missing is the likely e-mail, phone call or text that POGO's "Straus" operation fed him in the first place. I created a hashtag for this kind of crap. If you tweet (I've only played with it) and find this story elsewhere, retweet with #SmellsLikePOGO or #SmellsLikePogo (I covered both punctuations JIC). Which I only know about from the e-mail notification. For by the time I noticed the email and followed the feed, Donnelly's response had-- oddly enough--'morphed'. It’s always nice to have context to subvert an anti-defense faux-reform meme handed to you with the meme. My first thought from the initial RC response was: Hey! I know that statistic—I HAVE the report it came from (a DoD IG report #2015-090). He should probably have somebody explain it to him. Somebody who knows something this time. The IG report referenced in the tweet that was dumped down in the memory-hole IS EXTREMELY helpful, but probably NOT in the spirit in which it was invoked. The report has some great background and references, most of them are publicly accessible. This stuff is useful for several reasons addressing problems with the false 'F-35-Ejection-Seat-as-Greek-Tragedy' narrative in several areas. First,collectively the documents are of great benefit to help us scope the magnitude of the ‘Ejection Safety’ question itself. 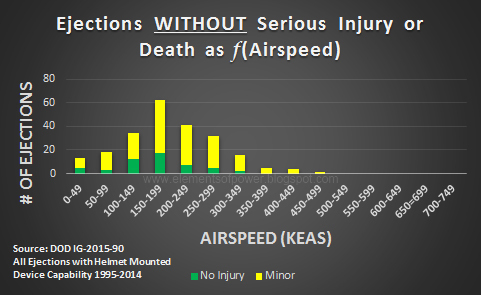 Second, the report clearly identifies the expected performance and ejection limitations of existing ACESII and NACES seat systems for a variety of aircraft when using helmets with just some of the devices and capabilities that are already built into the F-35’s helmet. Per the report, the ejection safety performance of existing systems (Pgs. 14-16) turns out be at best equal and in some ways worse than the F-35 system with the F-35 helmet design: as it now exists. Legacy systems cannot now, nor have they EVER been able to support use by an aircrew member weighing less than 136lb, so the fact that the F-35 system won’t either at the moment--while it is still in development--is hardly a scandal or even 'news'. It would be ‘news’ for about 5 minutes if it looked like it couldn’t be done, then I suppose someone could turn it into a ‘scandal’ if there was evidence of no wrongdoing being wrong-done. But there isn’t any indication of same, so…………where’s the story? Going beyond the small aircrew restrictions common to all the modern systems, is there any 'there' there that makes the F-35 ejection system unnecessarily more dangerous than legacy systems? The DoD IG report provides some dreaded context ought to send the purveyors of Too Dangerous F-35 Ejection meme scurrying. Not that it will, just that it ought to. Per the IG Report, one current ejection system combination (Pg. 17) has a lower maximum safe ejection speed limit than the F-35’s current limits. We also learn The Air Force is working on certifying a new ACES system that will probably be retrofitted into legacy systems, and quite frankly it wouldn’t surprise me to find out in the future that this faux ‘issue’ isn’t also being promoted in one way or another by unidentified promoters of the improved ACES system. Don't know if there are such forces at work, just know it wouldn't be surprising given the specifics of the DefenseNews unnamed 'expert' statements. 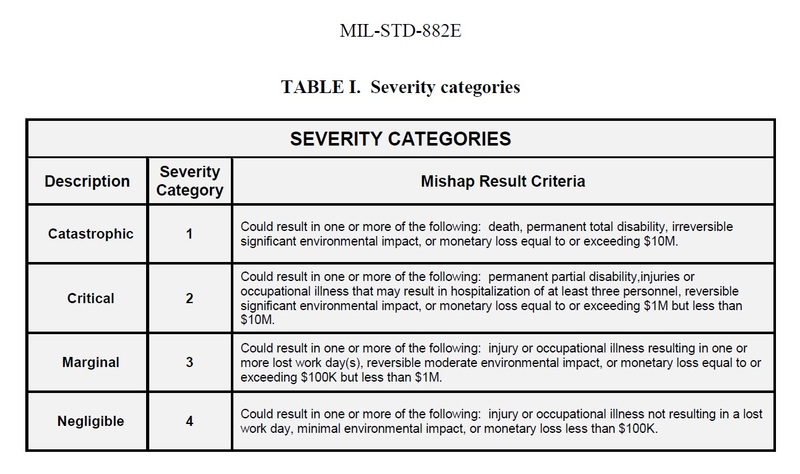 Using MIL‑STD‑882E, which defines the safety risk acceptance process and assuming that a major or fatal injury would be designated as a catastrophic consequence, the probability of occurrence would be identified as a 1D (catastrophic/remote). This level of risk is usually accepted by the program management office; in this case the aircraft Program Executive Offices. The PEO for the F-35 has accepted the risks for pilots weighing more than 136lbs. Those familiar with the risk assessment and risk management processes can probably envision what the categorization "1D" actually stands for, but it will be helpful to place it in proper context for the rest of the world by showing why and how ejection risks and category "1D" are positioned among all the other categories within the System Safety construct. 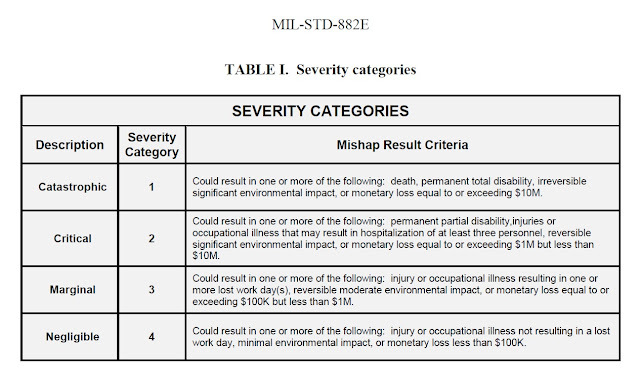 Here is Mil-Std-882E (current release) Table 1: Severity Categories. So then, what else COULD any ejection be other than a Level D category of probability? Each ejection seat gets one ride outside the airplane, and each airplane only gets one ejection maximum in its lifetime (duh!). You can’t say you can assume it will never happen, and you sure as he** don’t design airplanes such that ejection system use would be ‘likely’. Bottom Line: Category 1D is both the best you can do, and the worst you can accept for any ejection system. We could drill down even further into the data available, and ignore the fact that the F-35 ejection system is still being ‘worked’ to make it as safe as it possibly can be (the ‘requirement’ remember?). If one is so desperate to find an F-35 controversy that one would now debase themselves wallowing in the minutia and splitting hairs about WHERE in Category 1D the F-35 system currently lies relative to the legacy systems for pilots weighing more than 136 lbs, that’s easy enough to do to get an idea if they are at least of the same order of magnitude. There’s a lot of ambiguity in the figures in the report that prevent any direct comparison of history with any future risk calculations. First, these legacy numbers from the IG report are DoD IG calculations from 20 years of ejection history: they are the 'rates experienced' and not the product of a statistical analysis of all the risk factors involved. 1. The DoDIG numbers are ‘averages’ for many different aircraft/seat/headgear combinations, so there will be a range of values for each aircraft type by user within the average provided that we have no visibility into as to variations within the sample set and what if any correlations exist that would affect any comparison with other data. Just look at the variance between USAF and USN numbers for an example of variance even within the history. 2. The number of events--even over twenty years--is extremely small given the flight hours flown. If like a pair of dice is rolled for one outcome, even if the next ‘roll’ could be made under identical conditions, it probably would have quite a different numerical outcome, just not one that varied in any statistically-significant way. For an ejection, the factors are many, the combinations and permutations are astronomical. You should expect gross numbers to vary grossly. 3. 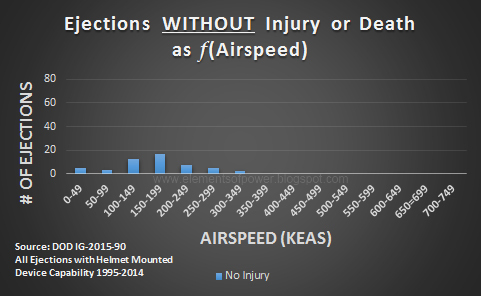 The number of ejections that occurred over the past 20 years, the type and combinations of injuries and causes include those ‘induced’ for reasons other than the system performance, including human error, and all of them occurred in a combination of operational environments and event conditions that cannot be exactly replicated. The future will be different. We can only guesstimate by how much. 4. These numbers are very small, and official risk analysis yields similarly other very small probabilities. Any time we are dealing with very small ‘long-tail’ probabilities it is important to remember the confidence in those same probabilities goes down. I suspect this is the reason that one comment from the Air Force System Lifecycle Management Center (pg. 33) that asserted the past could be used to predict future ejections was not included in the report (not just journalists have problems with statistics). There's more but I don't want to belabor the point for the small return on the effort. Now remember we also don't know the actual number Bogdan was referring to with that nice round 1 in 200,000 probability, and what the actual boundaries are of the phenonema falling under his defintion. 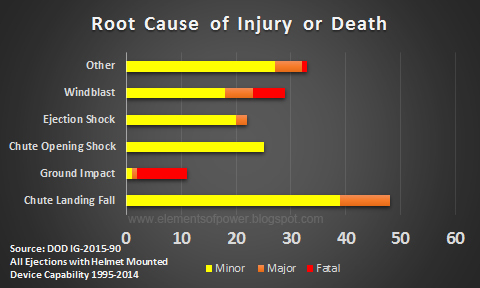 I suspect the number he used included minor neck injuries as well since he flatly stated 'neck injuries', but even assuming the worse, the round prediction number Bogdan used falls somewhere between the USN and USAF 'major injury or death' categories for all forms of injury that occurred in the past. We just went through a lot of la-di-da navel gazing just to observe that 'yes the predictions and the history of risk appear to be about the in the same 6th significant digit order of magnitude'. Any bets there still will be people who will try to claim the variation between the two is 'significant'? There's always somebody. Tell them get all the numbers they need to actually conclude something, but until then to STFU. Bogdan Testimony Sidebar: FYI and BTW, the Congresswoman asking LtGen Bogdan the fumbling question about survival odds and who introduces the news 'report' claims that we've been dealing with here into the hearing is none other than the current POGO/Straus Military Reform Project director's last employer. Rep. Jackie Spieirs (D-CA) had employed Mandy Smithberger as a staffer just prior to Smithberger returning to POGO/Straus to take over the reins from good ole' Winslow Wheeler. 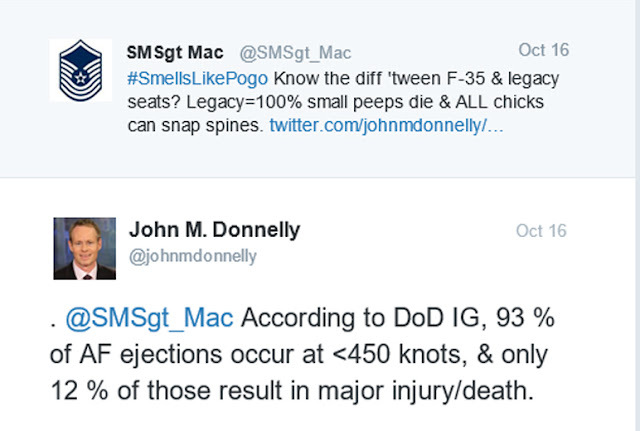 That would appear to very nicely close the loop on the Scary F-35 Ejection story's purpose and intent. Just another reason this Smells Like POGO. I want to know more about the 'revolving door' operation being run out of POGO, don't you? Fourth and finally, the DoD IG report itself, released just earlier this year, makes the VERY important and explicit point about not ‘evaluating’ the F-35’s ejection system at this time because it is still under development. A point that apparently NONE of the handwringers so far has thought was important enough to give them pause in their little 'group writing project'. If Schrödinger had been a fighter pilot, we would have never heard about his cat. Now, here we are in the warm-afterglow of the sub-committee hearings, and the meme being pedaled seems to have shifted to ‘journalists and progressive pols know more about ejection risk, and risk in general than those who do this stuff for a living'. Which is extremely funny. The critical phenomenon under examination is not the probability of an aircrew surviving an ejection once initiated. It is the probability of an aircrew surviving the mission, each and every mission. The probability of surviving each and every mission means surviving an ejection as a subset of the critical phenonemon must involve at least TWO* probabilities. The first is the probability you will need to eject in the first place, and the second probability is the probability you will or will not survive the ejection event. The second probability is called a 'conditional' probability. 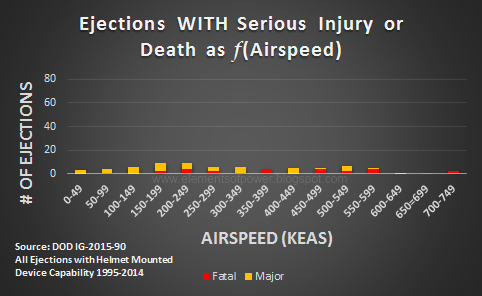 Neither the probability of survival or probability of perishing during an ejection actually exist (estimates are not 'existence') unless and until the need for ejection occurs in the first place. It is irrational to focus on the risks incurred only after an ejection is underway and ignore the probability of the need to eject. The probability of survival depends on both, and each are meaningless (to the pilot the most) without the other. *We can eliminate considering all prior variables if we assume the pilot gets in the plane and takes off in his ejection seat-equipped airplane in the first place. Any risks that are calculated (versus known or proven) and weighed as being acceptable or unacceptable are just a contributor to some overall aircrew survivability standard that cannot be exceeded. Within the overall survivability standard, the requirement is merely to design the plane to make the ejection as safe as possible, because as we have already observed, it is impossible to make it ‘safe’ in terms the average man-on-the-street envisions safety. I repackaged some of the ejection safety history found in the DoD IG report, just so I could look at it from different angles. Note the wide variety of the internal data between AF and Navy operations in the report affected how I viewed some of the rollup stats here. No conclusions to draw from it, just observations. Enjoy. The rest is about ‘updating the paperwork’, philosophical questions about the flexibility to operate in a responsive manner under handbooks and guides vs. one-size fits all mandates, etc. There are some odd turns of the phrase in the report as well. Things like "unfortunately" there not being any lightweight pilots who have had to eject in the last 20 years. 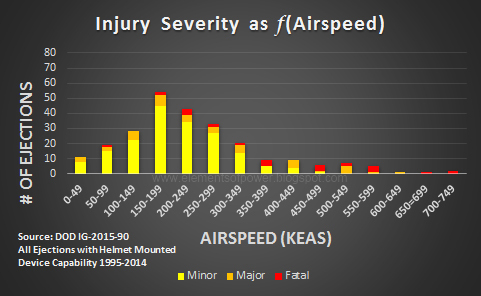 In any of the media reporting on F-35 and other helmet weights, the subject of how that weight is distributed rarely comes up, yet the effect on the balance of helmet when devices are attached is a very important factor (See here and here for examples) and the F-35 helmet design has a far better weight distribution than legacy systems and is therefore more ‘comfortable’. 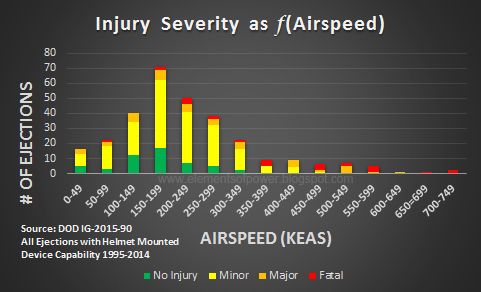 This better balance would suggest the F-35 helmet is a probably a safer helmet at the same weight and possibly even at a slightly higher weight than legacy systems. Time and data will tell.